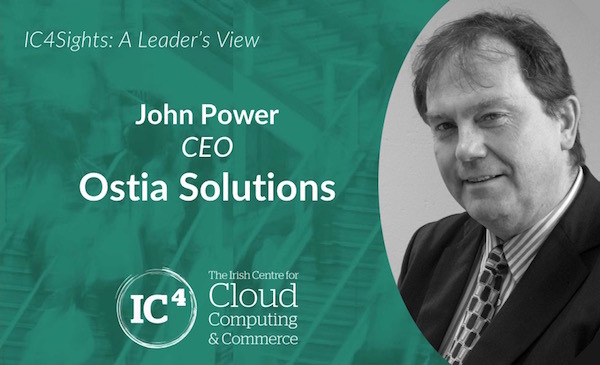 In the first edition of a series of interviews with IC4 member companies, we spoke with John Power, CEO of Ostia Solutions, an innovative supplier of technology that supports agile development and helps clients get products to market faster. John gave us an insight into what set him on the road to where he is now and the factors he sees affecting his industry in the near future. Over the next few months, we will continue this interview series and bring you insightful interviews with other members of IC4. As with any small business delivering innovative solutions, my role involves wearing a number of hats. This includes everything from managing the company finances and business plans to writing code or fixing issues for customers. I try, where possible, to stay focused on the technology side of things using others with complementary skills to keep the train on the rails. I became very frustrated with organisations complaining that they could not get to data and resources on their systems to satisfy business needs and it was clear to me that the issue was not technical. This led to the creation of our Portus integration technology to prove that by using standards and off the shelf technology, integration could occur a lot more quickly than before. This has helped us to understand that not only is integration an issue, but the testing against existing systems has become critical and a major bottleneck due to the complexity and cost of creating test systems. This led us to adapt our existing platform to mimic or simulate what these complex back offices systems do, enabling organisations to stand up test systems ‘on demand’ and safely in the cloud as there is no connectivity required to existing systems and, by using simulated data, your data is 100% safe and you get GDPR compliance out of the box. As a company, what have been your greatest challenges to date and how have you overcome them? The greatest challenge we have had to date have been around the target customers that we deal with. The vast majority are very large organisations where the sales cycle seems to be interminable. There was a major learning curve in translating what we do technically into business language so that people with budgets could see the value of what we offer. It is also clear that what we are doing needs a seed change in processes that have emerged over many years and enterprise organisations change their processes very very slowly. At the same time, they now appreciate that they need to speed up their processes to deal with the disruption that’s out there and we are perfectly positioned to help them with that. What trends do you see affecting your business and/or industry in the near future? 1. GDPR is going to be a massive change for all organisations and we can help ensure that organisations are 100% compliant with their test systems and data. 2. The PSD2 initiative also plays very well in our offering as this requires that large organisations do what they have rarely done before and that is; allow access of their back office systems to multiple external organisations. We can help them by creating sandboxed environments separated from the real environments thus enabling them to support and on board external partners more quickly and ensure that they are capable of connecting to their real systems. 3. Finally, the entire digital and cloud revolution is key for us. We can help organisations to implement an agile development methodology with more rigorous testing process enabling them to deliver products faster and with better quality. Looking back, was there a stand-out turning point moment that changed the course of everything? Yes. Realising that just because a company sees value in what you are offering doesn’t mean that they will buy it. The license or service cost involved in selling a product is only a relatively small fraction of the cost of making changes within large enterprises. We had to learn that there was a much bigger cost and effort and we had to speak to that when dealing with these companies and understand the potential pain better. What is next for Ostia Solutions? We are finally getting good traction with large FS organisations and we have just signed up our first Proof of Concept with a very large Telco. The goal will be to use these engagements to improve the product we have along with the processes around it and develop a number of use cases around these engagements to help us to target more of these types of organisations.